traveling East bound on E Williams St when he lost control of his vehicle striking several parked vehicles and the vehicle finally stopped after striking a front porch. Three of the vehicles suffered extensive damage and were towed from the scene. Officers were assisted at the scene by North Seneca Ambulance, Waterloo Fire Department, Seneca County Sheriffs Office, and the New York State Police. Morrison was released on traffic tickets and is to appear in the Village of Waterloo Court on December 19th, 2018. The Waterloo Police Department arrested Michael Tobin Jr, age 26, of Waterloo, NY, on charges of Criminal Mischief 3rd, Criminal Contempt 2nd, Harassment 2nd and Resisting Arrest. The charges stem from an incident on Church St on 10/30/18. Tobin is accused of spitting at a person who had an active order of protection against him and then running from police when they attempted to arrest him. Tobin was also charged with damaging an entry door to a building on Church St. He was arraigned at Seneca County Central Arraignment and held on $2500/$5000 bail, and a stay away order of protection was issued for the victim. The Waterloo Lions Club will be holding its annual Halloween Parade tonight, October 25 starting at 7PM. Anyone who is interested in participating in the parade should arrive in costume at the American Legion in Waterloo at 6:30PM for line up. The parade will step off at 7PM which will be led by the Waterloo Police Department and travel west on West Williams Street to Chestnut Street and end at the VFW, 29 West Elisha Street. The Waterloo Middle School Band will also be performing in the parade, and the Waterloo Fire Department will be following behind in a fire truck to ensure safety. Participants are encouraged to enter the VFW through the double doors and enjoy refreshments inside the VFW. 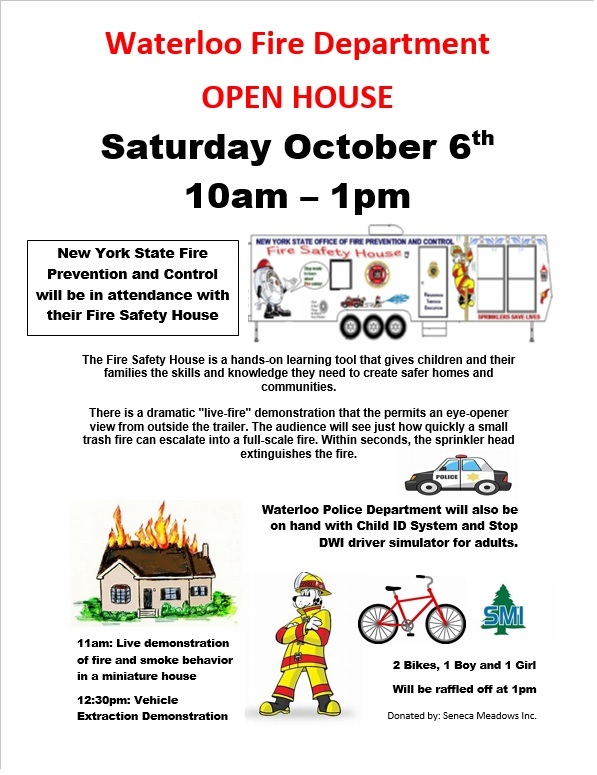 There will be pizza, candy, cider and other treats to enjoy. The Waterloo Lions Club will also be judging costumes and handing out awards. Parents are encouraged to walk with their kids in the parade and to make sure that the costumes are visible in the dark in some fashion, and that they can see clearly through any mask that they wear. Come out and help kick off the Halloween season. The Waterloo Police Department reports, on 10-23-18 at 6:55pm, officers arrested Justin D. Warner, age 28, of Gorham, NY. Warner was taken into custody on an arrest warrant for Criminal Contempt in the 1st degree (E Felony), and Aggravated Harassment in the second degree (A Misdemeanor). The charges stem from an incident on 6-11-18 where it is alleged that Warner made threats over the phone to a protected party of an order of protection. Warner was already secured at the Seneca County Correctional Facility on other charges, and was held for Central Arraignment Court. Resisting Arrest. The charges stem from an incident where it is alleged Reilly was harassing other residents of her apartment complex. When Officers responded, Reilly made several comments of harming other people with a knife. Reilly refused to come out of her apartment and barricaded the door. Reilly was subsequently taken into custody after Officers made entry through a window and secured at the Seneca County Correctional Facility to await Central Arraignment. The Waterloo Police Department was assisted by the Seneca County Sherriff’s Office. The Waterloo Police Department reports on 10/20/18 at 8:38 PM Michael J Tobin, 26, of Waterloo NY was arrested for Aggravated Harassment in the second degree (class A misdemeanor). The arrest stems from an incident occurring at approximately 1:00 AM on 10/20/18 where it is alleged Tobin harassed a Waterloo resident, making racial and threatening remarks over the course of the incident. Heers was transported to the Seneca County Correctional Facility for pre-arraignment holding. The Waterloo Police Department reports, on October 15th, 2018 at 4:42pm, officers arrested Natalie D. Rivers, age 40, of 214 W Main St Waterloo, NY. Rivers was charged with Grand Larceny in the 4th degree, Burglary in the 2nd degree, Petit Larceny, Disorderly Conduct, Endangering the Welfare of a Child and 2 counts of Criminal Trespass in the 2nd degree. The charges stem from various calls reporting a female had entered several different residences in the Village. Rivers was taken into custody and secured in the Seneca County Correctional Facility to await Central Arraignment Court. 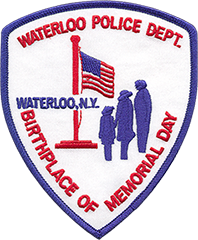 The Waterloo Police Department was assisted by the New York State Police. The Waterloo Police Department reports, on October 5th, 2018 at 12:55am, officers arrested Timothy J. Fridley, age 38, of 26 Daniels St Seneca Falls, NY. Fridley was charged with Burglary in the third degree, Grand Larceny in the fourth degree, Petit Larceny and Criminal mischief in the 4th degree. The charges stem from a call for burglary alarm at a Village of Waterloo Business, where it was found that someone had forcefully entered the building and stole a quantity of cash. Fridley was taken into custody and secured in the Seneca County Correctional Facility to await Central Arraignment Court. The Waterloo Police Department was assisted by the Seneca County Sheriff’s Office, and assisted by the Seneca Falls Police Department.